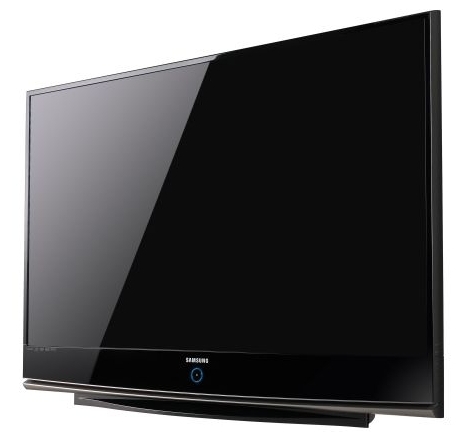 Samsung’s HL61A750 LCD TV comes with a solid feature package, with lots of options for picture optimization, and generous connectivity to accommodate all video sources without any issues. It is an excellent performer but with the price less than $2,000 (street price). The Samsung HL61A750 sports a glossy black finish with a very thin bezel surrounding the left, right, and top edges of the screen. The remote control has undergone a complete makeover with glossy black finish, but with no backlit at all. The round dial around the Enter button is meant to assist in navigate the menu. The HL61A750 has a resolution of 1080p, which works out to 1,920×1,080. With a 61-inch screen you should be able to see the benefits of 1080p over 720p, at a very close seating distance of 7 feet. Three picture modes are available, including Dynamic, Standard, and Movie. Movie mode produces the best results at the factory presets. Selectable color temperatures are Cool 1, Cool 2, Normal, Warm 1, and Warm 2. The Detailed Settings menu includes several additional adjustments such as Black Adjust, Dynamic Contrast, Edge Enhancement, and xvYCC Color. The LED control adjusts the backlight for the LEDs is useful in optimizing the black level of the TV set. Samsung’s Blue Only mode is helpful in getting color and tint set correctly while Color Gamut comes set to sRGB for the most accurate setting. The Samsung’s selection of aspect ratio modes is solid. “Just Scan” option displays 1080i and 1080p without scaling. There are AV connections but more important connections are the three HDMI inputs. There are two component video inputs for any analog HD devices, single S-Video input and two composite video inputs for standard-definition analog video and a PC-style VGA input, as well as a digital optical audio output. Color fidelity is superior with exceedingly accurate. The primary colors and the grayscale out-of-the-box performance is impressive. By proper manipulation of the LED Control feature, blacks is outstanding and can be made to surpass the old microdisplay black-level champs–the Sony SXRD sets. Samsung produced a convincing dark black field with little or no noise. Video processing on the HL61A750 is excellent and it passed both the Video and Film Resolution Loss tests on the Silicon Optix HQV Blu-ray test disc, correctly preserving all the resolution in the signal. White field uniformity is exceptional on this set and it could reproduce the scene “long pan of snow-covered mountains” flawlessly.